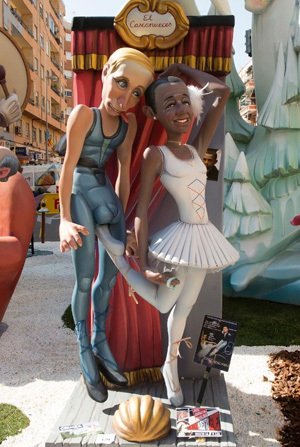 Valencia (Spain) (AFP) – A grinning Barack Obama in a white tutu kicks Vladimir Putin in the privates. Angela Merkel bends and bares her bottom. 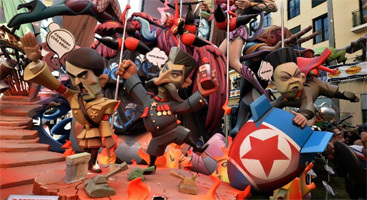 These are just three of the hundreds of satirical effigies mounted at the Fallas festival in Valencia, Spain, which celebrates its noisy finale this week. Politicians, celebrities and fantasy characters star in the colourful, often grotesque “ninots” — groups of cardboard and polystyrene models built by local artists and placed in the streets. For nearly three weeks, giant firecrackers have boomed around the city and the smell of fried pastries and paella have filled the air, leading up to Thursday’s finale when about 760 ninots will be burned in a last night of revelry. “The Fallas are a way of life for me. It’s practically a religion. It’s an act of devotion,” says high school teacher Vicente Rodriguez, 26. Like his father and grandfather before him, he is a “Fallero” — a member of one of 380 local Falla committees. “It was a way for the people to humorously criticize and ridicule the powerful who abused their power,” Palomarez said. Click here for more from Yahoo News. This entry was posted in Out & About on March 20, 2015 by admin.